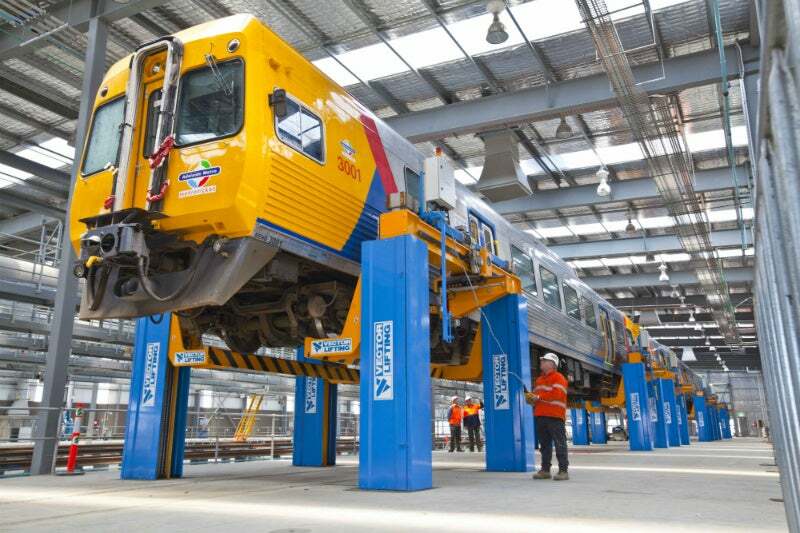 Vector Lifting is recognised throughout Australasia as the leader in heavy vehicle lifting equipment, particularly when it comes to railway maintenance equipment. With over 25 year’s experience in this specialised field, Vector Lifting has the engineering solutions for all types of materials handling problems. Efficient maintenance and service facilities can mean the difference between acceptable and unacceptable profits. This is especially true when that facility is for light or heavy railway systems, urban transport authorities or long haul passenger and freight terminals. All Vector Lifting systems are designed with a sharp focus on experience, quality and reliability, with safety also being a major consideration. Hence, our products not only inherit our extensive knowledge in the form standard features, but also offer a flexibility in design to suit specific client needs. Our projects have included full turn-key installations, with vector lifting taking responsibility from design to the fully operational finish. Such a project was completed for the Taiwan High Speed Rail Corporation in Kaohsiung, Taiwan, which as part of the facility included an under-floor lifting system capable of lifting simultaneously all 12 cars of an Electric Multiple Unit (EMU) trainset. The innovation and engineering excellence found in all our products has contributed to Vector Lifting’s rapidly developing global reputation as a leader in design and construct projects for this market. Vector Lifting has developed numerous under-floor lifting systems to suit our client’s specific requirements. With a home position below rail level, workshop areas remain clear of machinery and trafficable for personnel and other machinery. Our systems remain flexible to vehicle type, capacity and size, so we can confidently offer a solution to almost any situation presented. One of our more challenging under-floor projects was completed for the Taiwan High Speed Rail Corporation in Taiwan. An under-floor lifting system capable of lifting all twelve cars of an Electric Multiple Unit (EMU) train-set, a total of 300m and 720t of simultaneous lift. The cantilevered system provides 2.4m of lift enabling removed bogies to pass under the raised railcar bodies for the full length of the track. In addition to the lifting requirements, the system had to offer stability during any occurring earthquake, which frequently affect Taiwan. Bogie drop tables enable the removal of a single bogie from a railcar without the need to raise the rail car body, resulting in fast and efficient bogie exchange. Body stands support the railcar body as the bogie is lowered into the drop table pit, where it traverses and is raised to an adjacent rail where repairs can be undertaken or a replacement bogie loaded for replacement to the railcar. Projects are designed to suit each clients needs, including train type, unit capacity, workshop footprint and auxiliary functions. Railway jacks have been developed to facilitate safety, high efficiency and high productivity, performed on rail stock, electric and diesel multiple units, passenger trains and locomotives. Through years of experience Vector Lifting has developed a range of fixed and mobile screw jacks which feature cantilevered extendable anvils for positioning and vehicle pick up, as well as double lifting jack systems which provide both vehicle lift and bogie removal. With railway jack capacities in excess of 35t per jack, and the availability to link and operate multiple jack arrangements, total flexibility is offered to satisfy the client’s needs. The Above Floor Lifting System has been developed by Vector Lifting to assist in the maintenance of electrical multiple units (EMU). Vector Lifting is now an experienced global design and construct consultancy. Significant projects in Brunei, South America, China and Taiwan have been successfully designed by our innovative engineering staff and built to exacting standards for various clients. The Victorian Government initiated an upgrade to the existing Shepparton railway line, as part of a massive ongoing revival of public transport system in Victoria. Vector has designed and installed a number of bogie turntables to assist with the flow of maintenance within train maintenance facilities, with bogie turntables included in Craigieburn Train Maintenance Facility (x2), Dry Creek Maintenance Facility, Westall Train Maintenance Facility, Taiwan High Speed Rail and Nowergup. Vector Lifting Locomotive Turntables are designed to rotate a single locomotive or set of wagons to ensure safety and efficiency allowing a quick turnaround time for locomotives entering and leaving the yard. The turntable system is installed within the concrete pit to allow ease of access to all areas of the turntable. When the turntable is not in use the main girder beam is in line with the incoming rail track and locked into position. Vector Lifting has developed a compact and efficient Drop Table to assist in safely facilitating the replacement of a wheel set-traction motor assembly from under a locomotive. Vector Lifting is a totally independent company and is not associated in any way with the “Vector Group”. Vector Lifting Pty Ltd is an Australian based company, established in 1989, engaged in the design and manufacture of specialist lifting and railway maintenance equipment.